Tawfik S, Sultan A, Amer H, Sadek AM, Mahmoud S.
Cairo Hospital for Dermatology & Venereology "AlHaud AlMarsoud", Cairo, Egypt. A 40-year-old male presented with itchy small nodules over the thigh, scrotum and pubic area of gradual onset and progressive course of 9 months duration. Histopathologic examination revealed horn filled crater with lip like projection at the side of the crater. Keratoacanthoma (KA) is a relatively common low-grade malignancy that originates in the pilosebaceous glands and pathologically resembles squamous cell carcinoma (SCC). In fact, strong arguments support classifying KA as a variant of invasive SCC . In most pathology/biopsy reports, dermatopathologists refer to the lesion as "squamous cell carcinoma, keratoacanthoma-type". KA is characterized by rapid growth over a few weeks to months, followed by spontaneous resolution over 4-6 months in most cases. KA reportedly progresses, although rarely, to invasive or metastatic carcinoma; therefore, aggressive surgical treatment often is advocated. Whether these cases were SCC or KA, the reports highlight the difficulty of distinctly classifying individual cases [2, 3, 4, and 5]. A 40-year-old-male, working as a car mechanic, presented with itchy small nodules over the groin area of gradual onset and progressive course of 9 months duration. On examination, there were multiple pinkish-red dome-shaped firm nodules which were sharply marginated with raised borders and measuring 0.5 to 1mm. The closer inspection of the lesions revealed smooth crater filled with central keratin plug that was projecting like a horn on the smooth shiny surface of the nodules which were localized to the skin of the thigh, scrotum and pubic area. Fig 2: The well-defined nodules show a smooth crater filled with central keratin plug. Differential diagnosis included: giant warts, multiple keratoacanthoma, prurigo nodularis and squamous cell carcinoma. 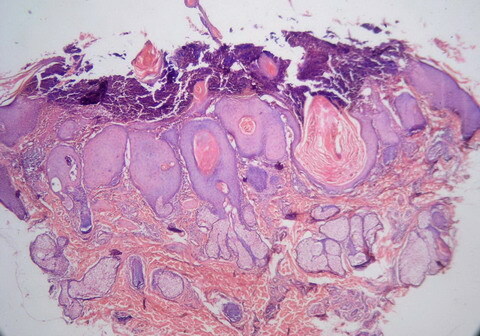 Histopathologic examination revealed horn like crater surrounded by lip like projection and the strands of the epidermis were protruding in to the dermis. Those findings were consistent with diagnosis of multiple keratoacanthoma. Keratoacanthoma (KA) typically grows rapidly, attaining 1-2 cm within weeks, followed by a slow involution period lasting up to 1 year and leaving a residual scar if not excised preemptively. Since expedient therapy almost always is instituted, the true natural course of the tumor cannot be confirmed with certainty. Physical findings in KA are limited to the skin. The lesions typically are solitary beginning as firm, roundish, skin-colored or reddish papules that rapidly progress to dome-shaped nodules with a smooth shiny surface and central crateriform ulceration or keratin plug that may project like a horn. Most keratoacanthomas occur on sun-exposed areas. The face, neck, and dorsum of the upper extremities are common sites, while truncal lesions are rare. Both sunlight and chemical carcinogens have been implicated as pathological factors in growth of the tumor. Trauma, human papilloma virus, genetic factors, and immunocompromised status also have been implicated as etiologic factors. In this case, the patient being a car mechanic exposed to tar and trauma, the lesions developed in hidden areas of the body other than sun exposed ones. KA is less common in darker-skinned individuals, rarely affects persons less than 20 years, the incidence increases with age and male-to-female ratio for is 2:1. It may be a component of Muir-Torre syndrome, which is a cancer-associated genodermatosis with multiple sebaceous neoplasms (adenomas, epitheliomas, carcinomas, Keratoacanthomas), and gastrointestinal malignancies (most commonly colon), although other carcinomas have been reported (genitourinary, pulmonary, endometrial). When Muir-Torre syndrome is diagnosed, an age-appropriate cancer screening workup is indicated. An approximately equal number of internal malignancies are diagnosed before and after the cutaneous neoplasm. These internal malignancies tend to be low grade, but early diagnosis is important. Colonoscopy, rather than flexible sigmoidoscopy, is recommended, since the colon cancer frequently is found in the right ascending colon, proximal to the hepatic flexure. KA is believed to have a good prognosis; however, it has been reclassified as SCC-KA type to reflect the difficulty in histological differentiation, as well as the uncommon but potentially aggressive nature of KA. It infrequently presents as multiple tumors and may enlarge (5-15 cm), become aggressive locally, or rarely, metastasize [6, 7]. The treatment includes surgical excision (primary intervention), radiotherapy and medical treatment using systemic steroids, systemic retinoids, intralesional methotrexate, 5-fluorouracil and bleomycin. 1. Manstein CH, Frauenhoffer CJ, Besden JE. Keratoacanthoma: is it a real entity? Ann Plast Surg. 1998; 40 :469-72. 2. Schwartz RA. 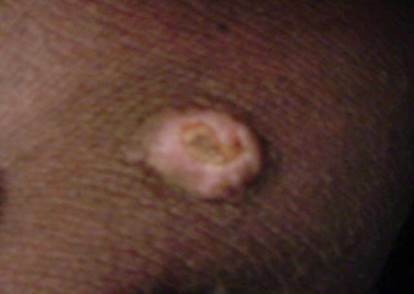 Keratoacanthoma. J Am Acad Dermatol. 1994; 30: 1-19. 3. Magalhães RF, Cruvinel GT, Cintra GF, Cintra ML, Ismael AP, de Moraes AM. Diagnosis and follow-up of keratoacanthoma-like lesions: clinical-histologic study of 43 cases. J Cutan Med Surg. 2008; 12: 163-73. 4. Kossard S, Tan KB, Choy C. Keratoacanthoma and infundibulocystic squamous cell carcinoma. Am J Dermatopathol. 2008; 30: 127-34. 5. Cribier B, Asch P, Grosshans E. Differentiating squamous cell carcinoma from keratoacanthoma using histopathological criteria. Is it possible? A study of 296 cases. Dermatology. 1999; 199 :208-12. 6. Frank TL, Maguire HC Jr, Greenbaum SS. Multiple painful keratoacanthomas. Int J Dermatol. 1996; 35: 648-50. 7. Sanders S, Busam KJ, Halpern AC, Nehal KS. Intralesional corticosteroid treatment of multiple eruptive keratoacanthomas: case report and review of a controversial therapy. Dermatol Surg. 2002; 28: 954-8.